Quince cheese, (also known as quince paste), is a sweet, thick jelly made of the pulp of the quince fruit. It is a common confection in several countries. Traditionally and predominantly from the Iberian Peninsula, in Spain it is called dulce de membrillo and marmelada in Portugal, where it is a firm, sticky, sweet reddish hard paste made of the quince (Cydonia oblonga) fruit. It is also very popular in Brazil (as marmelada), France (as pâte de coing), Argentina (as dulce de membrillo), Uruguay, Italy, Chile, Peru, Mexico and Israel (where it is a typical Sephardi dish). The recipe is probably of ancient origin; the Roman cookbook of Apicius, a collection of Roman cookery recipes compiled in the late 4th or early 5th century AD gives recipes for stewing quince with honey. Historically, marmalade was made from quinces. The English word "marmalade" comes from the Portuguese word marmelada, meaning "quince preparation" (and used to describe quince cheese or quince jam; "marmelo" = "quince"). Nowadays (in English) "A marmalade is a jellied fruit product which holds suspended within it all or part of the fruit pulp and the sliced peel. It is prepared from pulpy fruits, preferably those that contain pectin. Citrus fruits are especially desirable because of their flavor and pectin content." Quince cheese is prepared with quince fruits. The fruit is first cooked in water, and the strained pulp is then cooked with sugar. It turns red after a long cooking time, and becomes a relatively firm quince jelly, dense enough to hold its shape. The taste is sweet but slightly astringent, and it is similar in consistency, flavor and use to guava cheese or guava paste. Quince cheese is sold in squares or blocks, then cut into thin slices and spread over toasted bread or sandwiches, plain or with cheese, often served for breakfast or as a snack, with manchego, mató, or Picón cheese. It is also often used to stuff pastries. 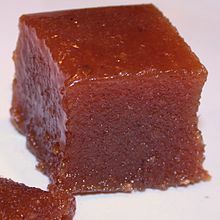 In Spain, Ecuador, Argentina, Chile, Mexico and Uruguay, the quince (Spanish membrillo) is cooked into a reddish gelatin-like block or firm reddish paste known as dulce de membrillo. The Pastafrola, a sweet tart common in Argentina, Uruguay and Paraguay, is usually filled with quince paste. In Argentina and Uruguay, a slice of quince cheese (dulce de membrillo) eaten with a slice of soft cheese is considered the national dessert. In Argentina it is referred to as vigilante. In Uruguay it is known as Martín Fierro in reference to the folk character from the epic poem Martín Fierro by Argentinian author José Hernandez. In the Philippines the dessert is known as membrilyo even if it is made of guava, since quince is unavailable in the former Spanish colony. It is a traditional part of the nochebuena array served on Christmas Eve. In French "quince paste" or pâte de coing is part of the Provence Christmas traditions and part of the thirteen desserts, which are the traditional dessert foods used in celebrating Christmas in the French region of Provence. In Serbia, especially Vojvodina, all of Hungary, and continental Croatia, i.e., Slavonija quince cheese is an often prepared sweet and is named kitn(i)kes, derived from German "Quittenkäse". Quince cheese, a New England specialty of the 18th century, required all-day boiling to achieve a solidified state, similar to the French cotignac. In Hungary, quince cheese is called birsalmasajt, and is prepared with small amounts of lemon zest, cinnamon or cloves and often with peeled walnut inside. Péter Melius Juhász, the Hungarian botanist, mentioned quince cheese as early as 1578 as a fruit preparation with medical benefits. In Vojvodina, its sometimes prepared with addition of finely grated walnut, hazelnut or pumpkin seeds. Sometimes a certain amount of sugar would be replaced by an equal amount of linden honey. In Pakistan, quinces are stewed together with sugar until they turn bright red. The resulting stewed quince, called muraba, is then preserved in jars. Wikimedia Commons has media related to Dulce de membrillo. ^ Lisa & Tony Sierra. "Dulce de Membrillo (Quince Paste) Information". About. Retrieved 9 December 2014. ^ a b c d "Vegetarians in Paradise/Quince History/Quince Nutrition/Quince Folklore/Quince Recipe". Vegparadise.com. Retrieved 9 December 2014. ^ "Orange Marmalade Taste Test - Cook's Illustrated". Cook's Illustrated. Retrieved 9 December 2014. ^ "Membrillo (quince cheese): How to...: Good Food Channel". Uktv.co.uk. Retrieved 9 December 2014. ^ Herbst, S.T. ; Herbst, R. (2007). The New Food Lover's Companion: More Than 6,700 A-to-Z Entries Describe Foods, Cooking Techniques, Herbs, Spices, Desserts, Wines, and the Ingredients for Pleasurable Dining. Barron's cooking guide. Barron's Educational Series, Incorporated. ISBN 978-0-7641-3577-4. Retrieved June 23, 2017. ^ "Postres uruguayos: el Martín Fierro". Todo Uruguay. Retrieved 2017-04-24. ^ "French Recipes - Traditional French Food and Desserts". About. Archived from the original on April 6, 2006. Retrieved 9 December 2014. ^ "Christmas Traditions in Provence". Provenceweb.fr. Retrieved 9 December 2014. ^ "Birsalmasajt". Chew.hu. Retrieved 9 December 2014. ^ "Birsalma sajt". Quali-t-uw.hu. Retrieved 9 December 2014.